Am I competent to write something about Istanbul? I’m German, I live and work in Germany. I love Istanbul, and I have been traveling to Istanbul every year for the past decade. I’ve been taught to be a Cultural Detective in a three-day course — in Istanbul. I have Turkish friends in Istanbul, Ankara, Izmir, Antalya and some smaller towns. Some are real friends, some are Facebook friends — acquaintances would be the old-fashioned word. These are normal women and men between 28 and 55. Usually they post photos of their children, their holidays, of flowers, insects, cats, information about books, music, quotations, cartoons, soccer … sometimes a political statement. Last Friday night, I noticed that something must have happened. Nearly ALL of them were posting photos and videos of demonstrations, of drastic police violence. I know the area around Taksim Square. I was shocked. I asked one of my friends what was going on, and I checked German and British media. The following day, several of my friends asked me to help spread the news to the world because Turkish media remained silent. Since Saturday, I’ve been looking at videos, photos, information — since I don’t speak Turkish, I had to check German and English media as well. A small group of demonstrators wanted to stop the government from felling over a hundred old trees in a park near Taksim Square for a shopping mall. They were few, they had a small camp, they were peaceful. The police disrupted the camp with tear gas and water canons. I’ve corroborated this with friends, Facebook, German and English media. This triggered, as it would in any country, a huge demonstration against police violence and against the government. These demonstrations have been continuing in Istanbul and have spread to about 50 other cities in Turkey — with police violence. More than 1700 people have been arrested, more than 2000 have been injured, per German and English media. These demonstrations were triggered by some comments by Turkish Prime Minister Erdogan. He called the demonstrators extremists and looters. In the German and English media, I couldn’t find any reports of looting. PM Erdogan has emphasized that he has been elected three times by the majority of the people, and that therefore the demonstrators are just a small minority. It is true that Erdogan had been reelected several times. His conservative Islam party, AKP, has paved the way for the largely conservative, religious, rural majority to better education and job opportunities. The mainly secular and well-educated urban population has always feared that Erdogan wants to create an Islamic state. Here we have a division along culture lines: Islamic – secular, more rural – more urban. This may be the underlying current of these demonstrations. But usually things don’t tend to be so simple. Only last week, the AKP majority passed a law forbidding the sale of alcohol between 10 PM and 6 AM. In some of the demonstrations people deliberately drank alcohol. The Erdogan administration has in past years put massive pressure on the media: There are more journalists imprisoned in Turkey than in China! And there’s also the headscarf issue … German and English commentaries say that people are getting increasingly fed up with Erdogan getting more and more authoritarian. They say that these demonstrations could for the first time pose a serious problem for him. 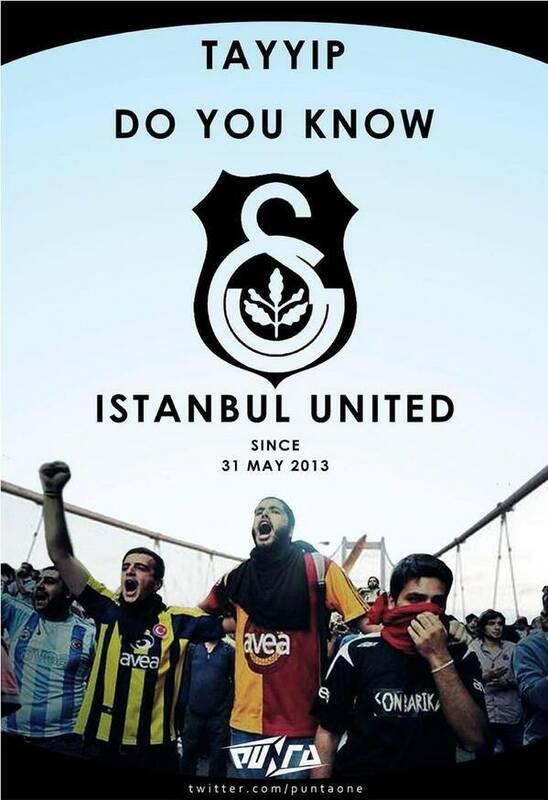 — and the three big soccer teams of Istanbul (Besiktas, Fenerbahce and Galatasray) have all united as well! THAT really is cross cultural competence!!! There is support: at least one of the big hotels at Taksim is offering food to demonstrators, as is a cultural center. Not only hospitals and universities but also mosques are looking after the injured. In the night, women clank pots on their balconies in support of the demonstrators. Now what about Erdogan’s majority? My friends are all secular — though I don’t believe such a condition really exists. Common sense and my training tell me that there is no such thing as black and white, as two granite blocks: “secular” and “religious.” The other day, there was a a photo on Facebook showing women with head-scarves at a demonstration — Devrimci Müslümanlar. I asked a friend about them. She told me that they are a (small) group of Muslim socialists who openly counter rumors of demonstrators attacking women with headscarves and demolishing mosques. Yes, it is a question of values, but not (only) of secular and religious, but of freedom — freedom of speech, for instance. Here is a news report that I trust may help explain the situation. This entry was posted in Commentary and tagged Cultural Detective, current events from an intercultural perspective, Erdogan, intercultural competence, Istanbul, Justice and Development Party, Prime Minister of Turkey, Taksim Square, Turkey by Dianne Hofner Saphiere. Bookmark the permalink.